One of the most common problems that we deal with is back and joint pain, people come to us daily with a range of different types of musculo-skeletal issues from the very acute and debilitating to the long term chronic complaints. We see people who are in a lot of pain with issues like slipped discs, muscular spasm, locked joints, torn muscles and ligaments. Low back pain is the curse of man, leading to millions of work hours lost every year. 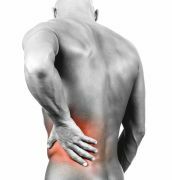 The Osteopathic approach to low back pain is the same as with all other areas of the body, to fully understand the underlying mechanical basis to the problem. This involves building up a picture of the mechanical stresses and weakness in the back including any specific spinal problems including wear and tear, spinal arthritis or trauma. Osteopathic treatment involves hands on treatment as well as self help exercise and advice. Our goal is always to promote self reliance and confidence in the patient with their particular back problem.